Objectives: Chronic hepatitis B virus infection remains a clinical problem for HBsAg (+) kidney transplant recipients. Lamivudine is the approved treatment; however, there are contrary views about optimal initiation. In case of resistance, novel nucleoside analogs should be considered but experience is limited. Materials and Methods: The study was a retrospective cohort study that included 58 HBsAg (+) kidney transplant recipients. Medical records were reviewed for nucleoside analogs, viral replication, and graft/hepatic functions. Prophylactic and preemptive lamivudine modalities were compared to reveal optimal initiation. Additionally, novel nucleoside analogs were evaluated for safety and efficacy. Conclusions: Lamivudine is an efficient means of providing comparable graft/patient survival with hepatitis-free kidney transplant recipients. The prophylactic initiation of lamivudine may be better in preventing hepatic dysfunction. Tenofovir can be an effective and safe treatment for lamivudine-resistant kidney transplant recipients. Lamivudine is the generally approved treatment choice and provides similar patient and graft survival rates compared with HBsAg (-) KTx recipients.3-5 However, the optimal time to begin treatment is controversial. Lamivudine can be used as prophylactic (HBV DNA (-), no hepatocellular injury), preemptive (HBV DNA (+), no hepatocellular injury), and salvage therapy (HBV DNA (+), with hepatocellular injury). Even if the prophylactic/preemptive initiation is the generally accepted treatment, the data comparing these treatments are few. This study sought to reveal the long-term graft/hepatic outcomes of prophylactic versus preemptive lamivudine treatment of HBsAg (+) KTx recipients and to investigate the novel nucleoside analogs, especially tenofovir, for the efficacy and safety to HBsAg (+) lamivudine-resistant KTx recipients. This was a retrospective cohort study. We reviewed the medical data of all KTx recipients who underwent a KTx at the Akdeniz University Transplantation center in Antalya, Turkey, from 1999 to 2010. During this time, 1838 KTx were performed; from these recipients, 58 (3.2%) were HBsAg (+). The medical records of these patients were further evaluated for immunosuppressive protocols, nucleoside analogs, viral replication, graft, and hepatic functions. Patients who tested positive for hepatitis C antibody, or for hepatitis C virus RNA, were excluded. There were 8 deceased- and 50 living-donor KTx recipients in the study group. The HBsAg was negative for all of the donors. The study was approved by the Ethical Review Committee of the institute, and all protocols conformed with the ethical guidelines of the 1975 Helsinki Declaration. The recipient’s induction immunosuppressive protocol was intravenous methylprednisolone and anti-thymocyte globulin or monoclonal antibodies (ie, daclizumab or basiliximab) as determined preoperatively. The maintenance protocol was prednisolone + mycophenolate mofetil, and calci-neurin inhibitors, or mammalian target of rapamycin inhibitors. The drug dosages were adjusted depending on serum drug levels on follow-up visits. transferase (ALT) levels were an indicator of viral replication and hepatocellular injury. The upper limit for ALT was 45 IU/L. Serum HBV DNA was quantified by a central laboratory using a real-time polymerase chain reaction kit (QIAGEN, Artus HBV RG PCR Kit, Germany). The cut off for HBV DNA positivity was at least 69 copies/mL. Serum albumin levels (normal range, 35-45.5 g/L) were used to evaluate hepatic synthetic function. The estimated glomerular filtration rate by the Modification of Diet in Renal Disease formula and proteinuria levels (protein/creatinine ratio in the morning urine) were reviewed for the graft function. In accordance with transplant center protocol, the renal and hepatic functions of the patients were monitored weekly for first 2 months, then biweekly for 6 months. If the recipient’s hepatic functions were stable, HBV DNA levels were examined every 6 months. Hepatitis B virus DNA levels were monitored more closely when the immunosuppressant dosage was increased or when hepatic dysfunction occurred. Graft loss was defined as the death of a patient with a functioning graft or a return to dialysis. In our transplant center, the treatment protocol for HBsAg (+) KTx recipients is the prophylactic or preemptive use of lamivudine. Lamivudine was initiated or continued owing to their treatment status before the transplant. Two groups were made to compare the effects of prophylactic and preemptive lamivudine use regarding viral breakthroughs (VBT), ALT elevation, and hepatic dysfunction rates. Viral breakthrough was defined as the redetection of serum HBV DNA at levels more than 10 times those of the lower limit of assay, in cases of initially negative HBV DNA, or elevation of HBV DNA levels more than 1 log10 from nadir under lamivudine coverage. Hepatic dysfunction was defined as a permanently elevated ALT level (at least twice the normal value [> 90 IU/L]) for at least 3 months, with HBV DNA redetection or elevation of HBV DNA levels. Lamivudine and novel nucleoside analogs were compared for safety and efficacy by evaluating their virologic/biochemical response and graft functions. Virologic response was accepted if HBV DNA level decreased after treatment. The biochemical response was considered as normalization of ALT levels. The initial dosages of nucleoside analogs were lamivudine 100 mg/daily, entecavir 0.5 mg/daily, adefovir 10 mg/daily, tenofovir 245 mg/daily. Statistical analyses were performed with SPSS software (SPSS: An IBM Company, version 16.0, IBM Corporation, Armonk, NY, USA). Continuous variables were expressed as the mean ± SD, and categorical variables as n (%). The Mann-Whitney U test was used to compare continuous variables, and the chi-square or Fisher exact test was used for categorical variables. The Kaplan-Meier method with the log-rank test was used to compare HBsAg (+) and (-) patients. The mean age was 35.6 ± 9 years; 86% of the recipients were men, and 85% of recipients had living-donor KTx. The induction immunosuppressive medications were 57% basiliximab, 12% daclizumab, and 12% anti-thymocyte globulin. Patients were administered a steroid, mycophenolate mofetil, and tacrolimus (40%), cyclosporine (34%), sirolimus (21%), or everolimus (5%) as a third medication. The HBsAg (+) recipient’s average creatinine level at their last visit was 115 ± 62 μmol/L, and mean estimated glomerular filtration rate was 1.21 ± 0.38 mL/s. They had an average 432 ± 895 mg/day proteinuria. As indicator of hepatic synthetic function, the mean albumin level was 43.8 ± 3.2 g/L. For hepatocellular injury, 47% of the recipients had at least 1 episode of an ALT level more than twice that of normal. Hepatitis B virus DNA was initially positive in 59% of the recipients and 26% of the recipients had an increase of HBV DNA replication posttransplant. The hepatic dysfunction rate was 22% (n = 13). For the HBsAg (+) recipients, progressive hepatic morbidity, hepatic cirrhosis, or patient death did not occur; however, 2 graft losses occurred because of biopsy-proven chronic allograft nephropathy. The Kaplan-Meier estimated patient survival of the HBsAg (-) recipients was 97.8%, 96.6%, and 95.7% during years 1, 5, and 10 (log rank, P = .17). Graft survival for the HBsAg (+) recipients was 98.2%, 95.8%, and 95.8% during years 1, 5, and 10, compared with 94.6%, 88.5%, and 73.7% in HBsAg (-) subjects (log rank, P = .18). The estimated graft survival for hepatitis-free recipients was 103.2 ± 1.2 months and 99.9 ± 3.3 months for HBsAg (+) recipients. In accordance with our transplant center protocol, all HBsAg (+) KTx recipients were using nucleoside analogs, mainly lamivudine, at the time of their transplant. Depending on treatment initiation time and HBV DNA presence, 24 KTx recipients were using prophylactic and 34 of them were using preemptive nucleoside analogs. In the prophylactic group (n = 24) the VBT rate was 16% (n = 4) and hepatic dysfunction rate was 12.5% (n = 3), 9 patients had elevation of ALT (37.5%). In this group, 1 patient had progressive HBV DNA replication (10.5 × 106 copies/mL). Lamivudine was withdrawn and entecavir 0.5 mg was initiated. During the 11th month, HBV DNA replication could not be suppressed efficiently, and treatment was changed to tenofovir. The response of patient to tenofovir was adequate, HBV DNA level decreased from 6.6 × 106 copies/mL to 1.3 × 106 copies/mL by the third month. The other patients, with hepatic dysfunction and ALT elevation, were sustained lamivudine and none showed hepatic morbidity. In the preemptive group, 32 patients used lamivudine and 2 patients used entecavir. The VBT rate was 32% (n = 11), and the hepatic dysfunction rate was 30% (n = 10), 52% of patients had elevation of ALT (n = 18). All of the VBT and hepatic dysfunction occurred in patients using lamivudine. For 2 patients using entecavir, VBT or hepatic dysfunction did not occur. Of the 10 patients with hepatic dysfunction, 4 of them had progressive HBV DNA replication. Lamivudine was withdrawn and treatment was changed to tenofovir 245 mg/daily for 3 patients and adefovir 10 mg/daily for the other patient. For the patient receiving adefovir, complete biochemical and virologic response (64 × 106 copies/mL to negative) were obtained at the 14th month. One of the 3 patients taking tenofovir had nearly complete virologic response, as HBV DNA progressively decreased from 15 × 106 copies/mL to 4290 copies/mL and biochemical response in first year. For other 2 patients, biochemical response was achieved during the sixth month, and HBV DNA levels were decreased progressively: in 1 patient, they decreased from 64 × 106 copies/mL to 791 250 copies/mL, and from 18.5 × 106 copies to 194 200 copies/mL in the other patient during the 12th month. Other patients with elevated ALT levels continued taking lamivudine. In these recipients, including the 4 patients with hepatic dysfunction and resistance to lamivudine, progressive hepatic morbidity did not occur. Lamivudine and nucleoside analogue effects on prophylactic and preemptive treatment are shown in Figure 1. As we compared prophylactic and preemptive lamivudine groups, there were fewer hepatic dysfunctions (12.5% vs 30%; P = .12), VBT (16% vs 32%; P = .17), and elevation of ALT levels (37% vs 52%; P = .24) in the prophylactic group, however these did not reach statistical significance. Evaluation of safety of novel nucleoside analogs showed that patients’ graft functions were well preserved at the end of the observation period and were not inferior to the KTx recipients taking lamivudine. Table 1 shows the graft functions compared between the 2 groups. Hepatitis B virus replication can accelerate after KTx, accounting for the detrimental effects on patient and graft survival. Fabrizi and associates showed that HBsAg (+) is an independent risk factor for transplant, that increases the risk of mortality 2.5 times and graft loss 1.44 times.1 However, after the advent of nucleoside analogs, comparable patient and graft survival rates with HBsAg (-) patients have been obtained in numerous studies.3-5,15 Although our study was a retrospective cohort study, it also supports these data and represents one of the largest case series of nucleoside analogs with 58 HBsAg (+) KTx recipients. Neither hepatic morbidity nor hepatic cirrhosis developed in any patient and no deaths occurred. Additionally, graft functions well preserved and graft survival was found to be comparable with hepatitis-free KTx recipients. Graft loss occurred in only 2 patients due to chronic allograft nephropathy. Lamivudine is an effective and potent inhibitor of HBV replication, it is approved worldwide for treatment of HBsAg (+) KTx patients, but there are contradictory views about its optimal initiation. Most authorities suggest prophylactic/preemptive use of lamivudine to cover the intense immunosuppressive period, low viral replication capacity of HBV, and chance of preventing further histopathologic injury of liver at early posttransplant period.5,16 Han and associates showed an average time of 8.4 months for viral replication, which represents the most intense immunosuppressive treatment period. In their randomized controlled study, they concluded that prophylactic/preemptive use of lamivudine was superior to salvage therapy. Furthermore, HBV reactivation occurred more frequently in patients chosen for salvage therapy in that study.4 Conversely, there are concerns about developing resistance and the appearance of mutant HBV species at prophylactic/preemptive modality.17,18 Moreover, lamivudine, as a salvage therapy, has been shown to effectively suppress viral replication, and suspend hepatocellular injury. However, there is risk of progressive increase of viral replication and development of permanent hepatic histopathologic injury.19 These difficulties could negatively affect the progress of the disease and patient/graft survival. In our study, in the prophylactic group, there were fewer ALT elevations, hepatic dysfunctions, and VBTs. Although these did not reach statistical significance (possibly due to low patient numbers), prophylactic use of lamivudine may be superior to preemptive treatment. Additionally, only 1 patient in the prophylactic group needed to alter their treatment as well as 4 patients in the preemptive group. Similar to our findings, a recent study by Chen and associates supports the prophylactic use of lamivudine in preventing HBV reactivation in occult HBV carriers.20 As a consequence, it is possible that all HBsAg seropositive end-stage renal disease patients who are candidates for KTx should be considered for lamivudine treatment even if they were HBV DNA (-). Continuing lamivudine has been suggested in case of VBT, because it has been shown that if lamivudine is continued, hepatocellular injury markers would be mildly affected and liver histology can be protected.17,21 Furthermore, in case of HBV mutant appearance, they had low replication capacity.22 Similarly, we found that when the lamivudine inefficiency or resistance occurred, continuing treatment stabilizes the patients’ clinical and laboratory status. We found that tenofovir was effective in HBsAg (+) KTx recipients regarding the biochemical response and suppressing HBV DNA replication. It was effective at an entecavir-resistant recipient. Similarly, adefovir successfully provided virologic and biochemical response in 1 patient. Graft functions were well preserved with these medications and were not inferior to KTx recipients using lamivudine. Interestingly, there were improved albumin levels with novel nucleoside analogs (P = .026); however, we ignored this result because of low patient numbers and multiple factors that affect albumin (eg, nutritional factors and inflammation). As a result, we may conclude that tenofovir is an effective and safe means of suppressing viral replication and stabilizing hepatocellular injury in HBsAg (+) KTx recipients who are resistant to lamivudine. Although this study represents one of the largest series of HBsAg (+) KTx recipient cohorts in comparing prophylactic and preemptive lamivudine treatment, there are limitations: it is a retrospective cohort study and it is not supported by any histopathologic data. Additionally, even if the novel nucleoside analogs seemed effective in treating HBsAg (+) KTx recipients, there were only 7 KTx recipients who were given novel nucleoside analogs; larger studies with longer follow-up times are warranted. Another limitation is that HBV mutant development could not be examined in patients who were resistant to lamivudine because of technical issues. It could only be examined in 1 patient who was in the preemptive group and mutant HBV genotype (YMMDVD) has found. In conclusion, we found lamivudine to be efficient in providing comparable graft/patient survival in HBsAg (+) KTx recipients compared with hepatitis-free KTx recipients. The prophylactic initiation of lamivudine may be better at preventing hepatic dysfunction and suppressing viral replication. It may be an accurate approach to initiate lamivudine as early as possible in HBsAg (+) KTx recipients and potential KTx candidates. Another important finding of this study is that in case of progressive hepatic dysfunction, novel nucleoside analogs (especially tenofovir) can be an effective and safe treatment. However, further prospective trials with larger patient numbers and longer follow-ups are warranted. Fabrizi F, Martin P, Dixit V, Kanwal F, Dulai G. HbsAg seropositive status and survival after renal transplantation: meta-analysis of observational studies. Am J Transplant. 2005;5(12):2913-2921. Ahn HJ, Kim MS, Kim YS, et al. Clinical outcome of renal transplantation in patients with positive pre-transplant hepatitis B surface antigen. J Med Virol. 2007;79(11):1655-1663. Han DJ, Kim TH, Park SK, et al. Results on preemptive or prophylactic treatment of lamivudine in HBsAg (+) renal allograft recipients: comparison with salvage treatment after hepatic dysfunction with HBV recurrence. Transplantation. 2001;71(3):387-394. Chan TM, Fang GX, Tang CS, Cheng IK, Lai KN, Ho SK. Preemptive lamivudine therapy based on HBV DNA level in HBsAg-positive kidney allograft recipients. Hepatology. 2002;36(5):1246-1252. Marcellin P, Chang TT, Lim SG, et al; and Adefovir Dipivoxil 437 Study Group. Adefovir dipivoxil for the treatment of hepatitis B e antigen-positive chronic hepatitis B. N Engl J Med. 2003;348(9):808-816. Tenney DJ, Rose RE, Baldick CJ, et al. Long-term monitoring shows hepatitis B virus resistance to entecavir in nucleoside-naïve patients is rare through 5years of therapy. Hepatology. 2009;49(5):1503-1514. Perrillo R, Hann HW, Mutimer D, et al. Adefovir dipivoxil added to ongoing lamivudine in chronic hepatitis B with YMDD mutant hepatitis B virus. Gastroenterology. 2004;126(1):81-90. Chang TT, Lai CL, Kew Yoon S, et al. Entecavir treatment for up to 5 years in patients with hepatitis B e antigen-positive chronic hepatitis B. Hepatology. 2010;51(2):422-430. Kamar N, Milioto O, Alric L, et al. 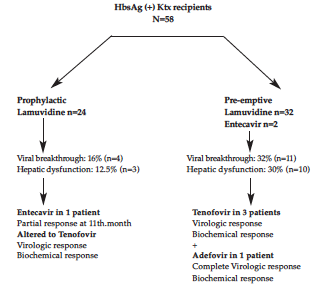 Entecavir therapy for adefovir-resistant hepatitis B virus infection in kidney and liver allograft recipients. Transplantation. 2008;86(4):611-614. Yap DY, Tang CS, Yung S, Choy BY, Yuen MF, Chan TM. Long-term outcome of renal transplant recipients with chronic hepatitis B infection-impact of antiviral treatments. Transplantation. 2010;90(3):325-330. Kamar N, Huart A, Tack I, Alric L, Izopet J, Rostaing L. Renal side effects of adefovir in hepatitis B virus-(HBV) positive kidney allograft recipients. Clin Nephrol. 2009;71(1):36-42. Fontaine H, Vallet-Pichard A, Chaix ML, et al. Efficacy and safety of adefovir dipivoxil in kidney recipients, hemodialysis patients, and patients with renal insufficiency. Transplantation. 2005;80(8):1086-1092. Daudé M, Rostaing L, Sauné K, et al. Tenofovir therapy in hepatitis B virus-positive solid-organ transplant recipients. Transplantation. 2011;91(8):916-920. Fabrizi F, Dulai G, Dixit V, Bunnapradist S, Martin P. Lamivudine for the treatment of hepatitis B virus-related liver disease after renal transplantation: meta-analysis of clinical trials. Transplantation. 2004;77(6):859-864. Filik L, Karakayali H, Moray G, et al. Lamivudine therapy in kidney allograft recipients who are seropositive for hepatitis B surface antigen. Transplant Proc. 2006;38(2):496-498. Liaw YF, Leung NW, Chang TT, et al. Effects of extended lamivudine therapy in Asian patients with chronic hepatitis B. Asia Hepatitis Lamivudine Study Group. Gastroenterology. 2000;119(1):172-180. Lau DT, Khokhar MF, Doo E, et al. Long-term therapy of chronic hepatitis B with lamivudine. Hepatology. 2000;32(4 Pt 1):828-834. Fornairon S, Pol S, Legendre C, et al. The long-term virologic and pathologic impact of renal transplantation on chronic hepatitis B virus infection. Transplantation. 1996;62(2):297-299. Chen GD, Gu JL, Qiu J, Chen LZ. Outcomes and risk factors for hepatitis B virus (HBV) reactivation after kidney transplantation in occult HBV carriers. Transpl Infect Dis. 2013;15(3):300-305. Leung NW, Lai CL, Chang TT, et al; and Asia Hepatitis Lamivudine Study Group. Extended lamivudine treatment in patients with chronic hepatitis B enhances hepatitis B e antigen seroconversion rates: results after 3 years of therapy. Hepatology. 2001;33(6):1527-1532. Dienstag JL, Goldin RD, Heathcote EJ, et al. Histological outcome during long-term lamivudine therapy. Gastroenterology. 2003;124(1):105-117. Gara N, Zhao X, Collins MT, et al. Renal tubular dysfunction during long-term adefovir or tenofovir therapy in chronic hepatitis B. Aliment Pharmacol Ther. 2012;35(11):1317-1325..
Perazella MA. Drug-induced renal failure: update on new medications and unique mechanisms of nephrotoxicity. Am J Med Sci. 2003;325(6):349-362.